According to the Centers for Disease Control, every year, slip and fall injuries cost Americans close to $34 billion for medical and hospital expenses. Older adults are more prone to the most serious injuries resulting from slip and falls, though individuals at any age can suffer broken bones, head trauma, or other injuries as a result of a slip and fall. When falls occur, there is a 20% chance that the fall will result in a serious injury. The CDC reports that falls can cause brain injury, wrist fractures, ankle fractures, and hip fractures. These injuries can lead to lifestyle changes, result in missed time at work, and may make it difficult for some individuals to live independently. Traumatic brain injuries resulting from slip and falls can be particularly pernicious. In some cases, it can take a while before patients experience the full range of symptoms of a head injury. Insomnia, memory loss, vision problems, changes in mood, and dizziness can all be symptoms of mild traumatic brain injury. Slip and fall victims may not be immediately aware that these changes can be linked back to their accident. This is why it is important for slip and fall victims to follow up with physicians following release from the hospital and to make sure that they are tested properly for all symptoms. Some slip and fall victims may experience post-traumatic stress disorder as a result of their accident. They may avoid situations similar to the circumstances leading to their fall. This can lead to major disruptions in life activities. Older adults are most prone to suffer following a slip and fall because their injuries—psychological and physical—are more likely to result in a more sedentary lifestyle. A slip and fall accident can affect an elderly adult’s health years after it takes place and can even shave off years from a person’s life. The National Floor Safety Institute reports that falls result in 8 million ER visits. Falls are the primary reason why individuals file worker’s compensation claims. Yet, many slip and fall injuries can be easily prevented. According to the National Floor Safety Institute, 85% of worker’s compensation claims occur because employees fell on floors that weren’t safe. If you’ve suffered a slip and fall injury in Miami because of an unsafe floor, you may be entitled to compensation for your injuries. 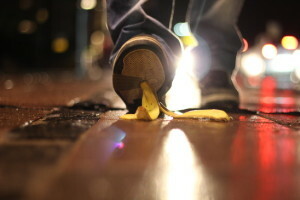 A Miami slip and fall lawyer may be able to assist you in filing a claim. Every year employers pay over $70 billion to employees for slip and fall claims. These numbers don’t take into account nursing home slip and falls, and slip and falls that occur at businesses due to premises liability. If you’ve been injured in a slip and fall, you need a slip and fall lawyer in Miami, Florida who understands the seriousness of your injuries and who is qualified to handle your slip and fall claim. The Wolfson Law Firm, L.L.P. is a personal injury law firm in Miami that will fight diligently to help you get the justice you deserve.